I would like to present Miss Molly-Mae (AKA Sweet Pea or just Pea) Born July 17th 2009. In the attached picture Molly is intently looking at her cat walking in the room after she had just taken the Santa hat off my head. She also likes to try and take my socks off. 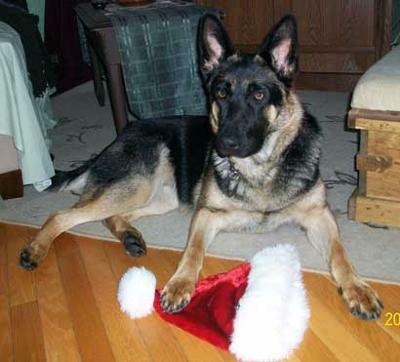 I adopted Molly from Breeders in my area (Sarnia, Ontario Canada) The Breeders farm is called “The Funny Farm” they also have an excellent kennel “The Howladay Inn”. Molly’s Mother is a pure black Shepherd named Midnight and her Father is a King Shepherd named Miracle notice a theme here. They have had great success with the litters. Midnight and Miracle are the perfect mix and have produced many beautiful, even tempered, perfectly marked GSD’s. Miss Molly is true to here astrological sign “Cancer”. She is caring, loving, gentle, smart and protective. She is my best friend. She has a cat named “Jace” and he can totally hold his own with her. Molly has just recently been bringing me my boots, after I have had a rest after work, to let me know it’s time for “walkies”. She likes to sleep beside me in bed on her own pillow. She enjoys her pool in the summer, playing in the snow, playing catch any time and chewing on “Rocky” her unstuffed animal. One of Molly’s pet peeves is “The Dog Whisperer” she goes crazy when she sees other dogs on T.V. which is a shame because it’s one of my favourite shows to watch. We are working on this issue but I may have to call on Cesar himself for this one. (lol) Molly is a pleasure to come home to. She had my heart at “woof” or with Molly it actually sounds more like “boof”. Molly, Jace and I wish you all a Merry Christmas and Happy New Year. I just came across this article because I love Shepherds but noticed a comment about Howladay Inn. First of all, Molly-Mae is beautiful and I'm happy with your story but I do want to update you on the current condition of Howladay Inn kennel. My husband and I moved to the area in early 2009 and travel quite a bit. We were looking for a reasonable kennel for our puppy and found Howladay Inn just as they opened. At first, they were perfect for our pup but soon things started happening. We would pick-up our pup and she would be “crusty” on one side. I didn’t say anything because I thought it was a fluke. The next time we picked her up, she stank and had diarrhea for the next 3 days! I called Maureen (very nice-talking owner) and asked her if anything was wrong with our pup. She said everything was fine. The last time we dropped her off; she did not want to go in and barked constantly. When we picked her up in 1 week we could see her ribs. This made me angry and I asked Maureen what happened! She went on about how our pup must have been sick when he first came and I asked why she didn’t call us or our friends when she noticed. She said she didn’t think it was a “big deal”! Maureen is a very nice lady but I think she is in the wrong business. The kennel stinks like a pig-pen, is very loud, and there are no runs! We will not be returning.